I believe this photo is from 1990. 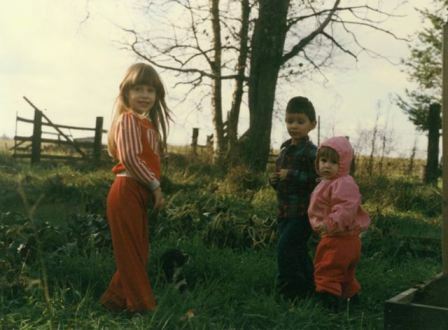 Sarah, Michael and Kayla (and a puppy named Pepper) are in our current backyard when it was much wilder and untamed. In this picture, I estimate that Sarah is five, Michael is four, and Kayla is two. For a while we tried raised bed gardening. I see one of those frames in the corner of the photo. I have been preaching through the Gospel of John for the last couple of years, and this Sunday I complete John chapter 10. This also concludes my study of the long confrontation between Jesus and the false teachers of Israel that runs from John 8:13-10:39. While studying this portion of Scripture, I have often thought of some of the debates raging in the Reformed world today and the frequent call for charity towards opposing doctrines. Well, charity is not a word you would use to describe Jesus’ attitude towards the false teachers of Israel! Scornful would be more accurate. Jesus’ example in handling doctrinal error is quite instructive — and surely his example is to be followed here as elsewhere. Our Lord was usually mild when dealing with the errors of simple folks. But when it came to false teachers he was anything but mild. He used the sharpest of language and cut them no slack at all. Perhaps the Book of James provides an explanation: “Those who are teachers will be held to a higher standard” (Ja. 3:1). The fact is that Jesus manfully and vigorously attacked the false teaching that opposed his gospel. This needs to be qualified, of course. Jesus was never rude in his personal dealings or unfair in characterizing the views of his opponents. Always, his actions and speech were ultimately motivated by love. Moreover, in following Jesus’ example we must note the difference between him and us. Jesus is possessed of divine perfections and knowledge. Since none of us is, we should be more hesitant and careful in denouncing error. Therefore, the Christian approach to matters of doctrinal division should always involve a humble awareness of our own limitations. But these motives of honesty, love, and humility should not be equated to uncertainty in matters of doctrine. To do so undermines our commitment to the essential clarity of God’s revealed Word, an important atttribute of the Bible that is frequently downplayed today. Moreover, Christ-like motives should not lead to tolerance of false teaching, especially in matters of great importance. Such tolerance violates another of Christ’s motives, namely, zeal for God, his Word, and his people. The fact is that Jesus sharply confronted false teaching and strongly rebuked recalcitrant false teachers. His church must be willing to do so today. We often are reminded today of the phrase “In essentials, unity; in non-essentials, liberty; in all things, charity.” I’m not sure how well this describes the approach of the Lord Jesus (not to mention the apostles). This especially depends on what we mean by “charity.” If we mean, “in all things, Christ-like love,” then amen. And this includes the kind of “love” Jesus gave to Jerusalem’s false teachers in John 8-10. But if by charity, we mean tolerance of important doctrinal errors, then the well-worn phrase, “in all things, charity,” simply cannot be applied to the example of our Lord.